Can you see Dependent Origination instantly at this (thought) moment? Re: Can you see Dependent Origination instantly at this (thought) moment? 1. "can one see DO right here and now?" Which implies the question "is DO happening right here and now?" Yes and yes. Since DO happens within us for most of us all the time it can be discerned through practice. Discernment happens exclusively only in the here and now. With a little bit of effort everyone can discern at least a few links or phenomena (like contact feeling tanha upadana etc) of the DO in the here and now. Perception happens linear, means one thing is perceived after the other, not simultaneously. DO is also linear. Feeling can't be perceived before contact. Contact is a prerequisite for feeling whereas feeling is not the prerequisite for contact. It happens in a linear order. A mind with samadhi can see that succession (eg contact arising then passing then feeling arising then passing) in life speed happening. Even the gaps in between. As well when one experiences the booting up of perception and etc after the cessation of perception one perceives and discerns the early links of DO (sankhara vinnana Nama rupa etc) naturally. In samadhi you have not really a perception of time but if you would talk in time the discernment of DO happens within seconds. But not at once in one moment so to say. Well in samadhi it is felt like one moment but in conventional terms of experience and talking time passes, even in timeless "one moment" samadhi one thing after the other is experienced, never simultaneously, that's impossible. Have to go now, might add something later. What does a "single thought moment" mean? Is it a solution to the problem of "self continuity" which implies single thought moments connected by ignorance? How does this idea solve the problem? In simple terms say you think first about an apple and nex about a banana. There are two distinctive thoughts. If you look carefully this each thought has many steps. comes in contact with its object (atīta bhavaṅga). 2) A bhavaṅga that vibrates for one thought moment (bhavaṅga calana). 3) A bhavaṅga that cuts off the flow (bhavaṅga upaccheda). Thanks Sarath. I will find time to read the book or parts of it depending on how useful i find it to be. In the meantime, taking two thoughts (banana and apple) to be distinctive still implies a connection. Firstly, each identified as a "single thought" implies that each is coherent from within, but has no connection with the other hence they are called/described as "distinctive". Therefore, there is still a connection between the two depending on: 1) each being coherent from within (distinctive), 2) but without connection with the other. In other words, without these distinctions (which are a form of connections), the conclusion of them being disconnected/separate/distinctive/single wont arise. Then, you went on deconstructing each distinctive thought into seventeen thought moments (which brings the validity of the previous distinction into question) and you seem to imply that the seventeen thought moments cannot be reduced any further without providing any explanation. This raises the question of whether the seventeen thought moments include the mental states that counted them, and if not, how have they been known to be seventeen? 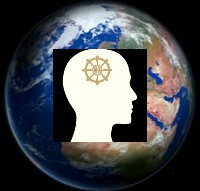 Even if there are seventeen thought moments they are distinctive and independent according to Abhidhamma. It is like the letters in a word. Each letter is distinct but we make some sense of the word. And we don't make sense of the letter through its ability to take part in forming words? What we experience is an illusion. The phenomena arise and pass away. But we give them a meaning and suffer. Seems to me like a fallacy of composition, which is assuming that what is true of a member of a group is true for the group as a whole. If a letter has no meaning on its own, that does not mean the same should apply to words. Why do you think reducing reality to a single moment/thought and then drawing conclusions out of it about reality as a whole is a beneficial exercise? Last edited by Bundokji on Fri Jan 11, 2019 8:57 pm, edited 1 time in total. There is a mango in the conventional sense but there is no mango in the ultimate sense. Thoughts are arising and perishing in our mind continuously. If we do not observe them very closely we become enslaves to them and prolonge our suffering. Perception happens linear, means one thing is perceived after the other, not simultaneously. DO is also linear. Feeling can't be perceived before contact. Contact is a prerequisite for feeling whereas feeling is not the prerequisite for contact. 1) Take a look at SN 12.67. There you have the simile of the two (always two) bundles of reeds standing against one another to describe DO/PS. If neither bundle is removed, both stand there together. There have been quite a few interesting spins and liberties taken with this sutta; most brush the explicit language in the simile aside. You say simultaneity is impossible, yet from the very beginning of the simile the bundles are there together. Not standing alone. The attempt to leave one or the other alone is not possible according to the sutta. The only exception is when suffering ceases, when the holding of the whole mass of suffering cease: the collapse of the that dependency culminates with, "That is how the entire mass of suffering ceases". Seems like a description of the arahat. It is hard to make a case for a sequential, singular rise and fall of each when you look at it in these terms. 2) What about the many suttas that describe DO/PS in both directions? Are you suggesting that dependency can't be shown in reverse order? 3) You say each is perceived one after the other. Is that perception aspect independent of each link? Please don't take my challenging of your ideas in the wrong way. I'm not one of these snipers trying to step on your every word. Just looking for an interesting discussion. I may not be back on until Monday. Maybe an arahat can see that in a moment, cos he has penetrated the dependant origination. I even doubt anyone can really see a citta in a realistic manner. Many thanks for making me aware of Sn 12.67. Interesting questions and points to consider. b. With the arising of feeling, contact [comes to be]. The message I get from the simile: 1. Eg If there is no contact, there is no feeling. If there is no feeling, there is no (or has not been) contact. Contact nor feeling can stand (be there) alone. 2. Recap: DO says: with this, there is this. The reverse order of the DO says: with this not being there, this is not there. If there is no aging and death there, then the rest of the DO is not there as well. That shows there is obviously dependency but important to note not a dependency of origination! Just a dependency of not being there. Another take away is if there is no aging and death there is also no consciousness so nothing can be known or seen. Means the reverse DO order is just a concept not an experiential experience. Thinking about it actually both orders of DO are just concepts to explain why things are there or not there (reverse order) and not experiental expierences. The DO concept is mostly if not always stated in connection to oppose all the other concepts of "why things are there" (like I created, God created, etc. ). The general law of dependency ("with this there is this; with this not being there, this is not.") on the other hand is an experiental experience and can be seen here and now, it's not just a concept. Certain links of the DO can be perceived/ seen in the here and now, certain links can't (but concluded in retrospect and observed in others or past lives with superhuman abilities). Whereas any link of the reverse DO obviously can't be seen in the here and now since there is no consciousness to do so. Your questions (thank you!) led me to compare my experiences with the concept of DO again and think of the whole chain of DO more thoroughly. While pondering about it I came to realise that right now I can't see the birth of my body (impossible to see now since that is a one time happening which lies in the past) nor lamentation, grief nor the death of my body (body is not dead right now, death lies in the future) so I have to correct my statement NO the DO (it is one set of links and you can't single out a few of them and say they are or represent the DO. Only all links together as one unit can be called DO. ) can't be seen in the here and now neither all together at once nor one after the other within your own experience. [Interesting side information I got from this sutta and this could also lead to a new interesting discussion: Sariputta stops at consciousness! He never goes on to say "if there is no avicca there is no sankhara" ! Nor does he say for sankhara to be there, there must be avicca! Or that the necessary condition for consciousness is sankhara!! Interesting but off topic. 3. What I stated in my first post were descriptions of direct experiential observations. Upon reflection as stated above I came to realise I haven't observed all the links of DO from beginning to the end in one succession one after the other in the here and now. Just certain sections of it. It is also impossible as shown above to see all links of the DO in the here and now. Nevertheless in the here and now things are always perceived one after the other. With samadhi, perception becomes even sharper and you can clearly see the arising, persisting and passing, gap, another phenomena arising, persisting and passing,... If seen to that degree that can result in patigha viraga osaga cessation etc.. Anyway the point here is there is no doubt that things are known one after the other. You can say upon conclusion or logic certain phenomena are simultaneously present but from a experiential viewpoint there is only one perception of one khanda or one sense contact or one dhamma or cetasika at a time. Perception is never independent or alone. It depends on so many things but I have the feeling I do not understand the meaning of your question right! If so what do you want to know exactly? Last edited by SkillfulA on Sat Jan 12, 2019 7:23 am, edited 1 time in total. The message I get from the simile: 1. Eg If there is no contact, there is no feeling. If there is no feeling, there is no contact. Which means the whole Dependent Origination arise together as a group? Which means the whole Depndent Origination perishes together as a group? In sn 12.67 quite interestingly sariputta doesn't even mention ignorance and sankhara. My take away is you can't just single out any links of DO to explain or compare with experiential experience. DO is one whole. It is a concept to make a statement to the question "how do things come to be?" . It is not a teaching to describe experiential experience as you can experience right here and now or a teaching to theoretically explain all sorts of possible scenarios (like the classic: "an arahant without avicca has obviously still all the links from sankhara til vedana but not tanha and upadana but then again aging and death. Neither DO nor reversed Do fits nor explains the experiential experience of eg an arahant! ) That's why people struggle since ages to translate DO into experiential experience. So much confusion about just a concept. Wow, thanks SDC for your challenging questions (thanks as well SarathW for opening this thread and of course DW and the internet and the Chinese who assembled this phone and... Everything happens in dependency, nothing alone!) You made me solve my own confusion trying to fit in my experiential experience and theoretical knowledge into DO and the other way around. The reverse DO doesn't persih as a group because it has not been there in the first place. Means, it does not mean first DO has been there and then in colapses from "aging and death" down to ignorance. That is impossible/ is nonsense if you think a little about it. It just means if there is no aging and death all the other DO links can't be possibly there. It seems the reverse DO was just mentioned to strengthen/ highlight more the point of the concept of dependency. As well it points to many other things. I need a rest, too much thinking. It is important to note that DO is not about the matter but about the mind. Not about Rupa but about Nama. We can't use DO to explain the physical body of an Arahant.